In stock -This product will ship today if ordered within the next 6 hours and 56 minutes. 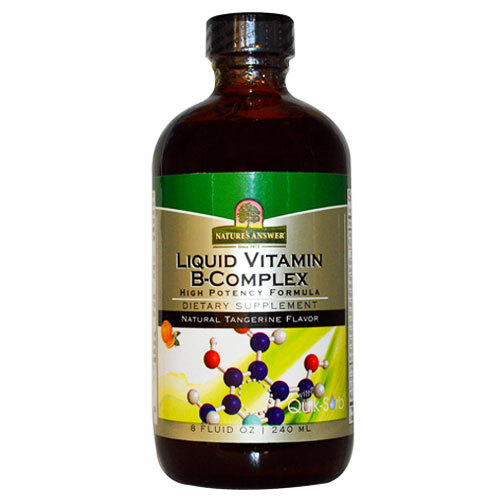 Nature`s Answer Vitamin B-Complex provides nutritional support in an easily absorbable form. Quik-Sorb is an exclusive blend of herbs known to enhance delivery of nutrients to the body. B vitamins support energy production and overall cell health. Other Ingredients: Purified Water, Vegetable Glycerin, Organic Agave Nectar, Natural Tangerine Flavour, Xanthan gum, Potassium Sorbate (0.2%), Vitamin E (as d-Alpha Tocopheryl Acetate), Quik-Sorb (ginger rhizome, amla fruit, capsicum fruit). As a dietary supplement take one tablespoon - 15 ml daily, with a meal or as directed by your healthcare practitioner. May be mixed with water or food. Below are reviews of Nature`s Answer Vitamin B-Complex - 240ml by bodykind customers. If you have tried this product we'd love to hear what you think so please leave a review.